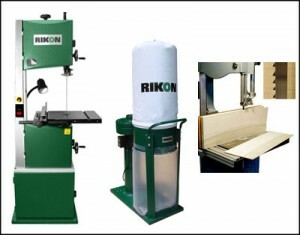 Only a few days left for you to enter Highland Woodworking’s Rikon Bandsaw Giveaway! With more than $1000 in prizes, including a Rikon 14″ Bandsaw, a Rikon 1HP Dust Collector, and our famous Wood Slicer bandsaw blade, you could give your shop a major facelift. Just think about all the woodworking projects you could do with your new Rikon bandsaw! Entries are being accepted until Noon Easter Time on Monday, October 31, 2011, and multiple entries are permitted. View our complete collection of Rikon Power Tools! Moulthrop Woodturning: A Quick Follow-up The Wood Whisperer Rocking Horse Charity Build: Saddle Up!